UPDATE: When I first secured a copy of the Mars Hill by-laws, I thought I had the most recent copy of them. However, I did not. The by-laws were amended again twice, most recently in May of 2012. Here is a copy of the May, 2012 revision. It is possible that the by-laws have been amended since then because the Board of Advisors and Accountability has the power to amend them at any time. However, my sources believe these are the most recent by-laws. I am adding the 2012 by-laws to this post so that interested readers can compare the two versions. One major change is the name of the ruling board, from Board of Elders to Board of Advisors and Accountability. Otherwise, not that much changed as far as I can tell. For many years Mars Hill Church was led by a board of Elders, most of whom were in a vocational relationship with the church and thus not able to provide optimal objectivity. 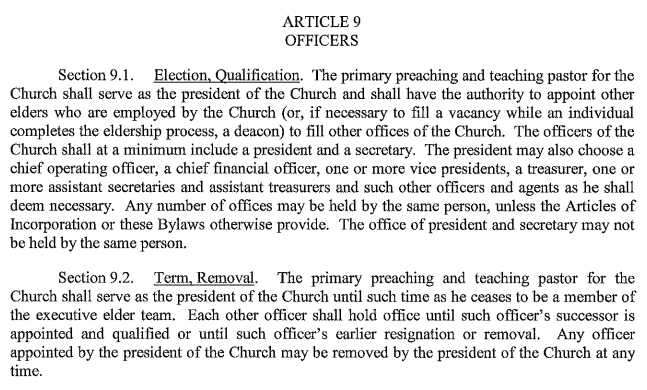 To eliminate conflicts of interest and set the church’s future on the best possible model of governance, a Board of Advisors and Accountability (BOAA) was established to set compensation, conduct performance reviews, approve the annual budget, and hold the newly formed Executive Elders accountable in all areas of local church leadership. This model is consistent with the best practices for governance established in the Evangelical Council for Financial Accountability standards. Mars Hill Church joined and has been a member in good standing with the ECFA since September of 2012. I have reviewed the MHC by-laws (click here to review a pdf of the by-laws) and I must admit that I am confused by this recent statement. If anything, it seems to me that these by-laws create more conflicts of interest and less oversight for the decision makers at MHC. 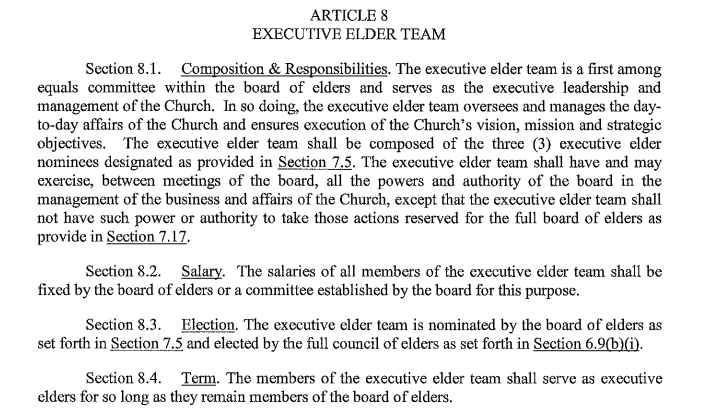 The executive elders (Mark Driscoll, Sutton Turner, Dave Bruskas) are a part of the seven member board which appears to be the main decision making body and according to the statement above, “hold the newly formed Executive Elders accountable.” This board sets compensation, appoints elders, handles legal matters, etc. The preaching and teaching elder (Driscoll) has special enumerated powers that the other elders do not have. I have contacted the ECFA to ask for their standards so I can compare these by-laws with those standards. At Mars Hill, members do not vote. The entire elder council includes all those appointed as elders and the three members of the executive elder team (Driscoll, Turner, Bruskas). 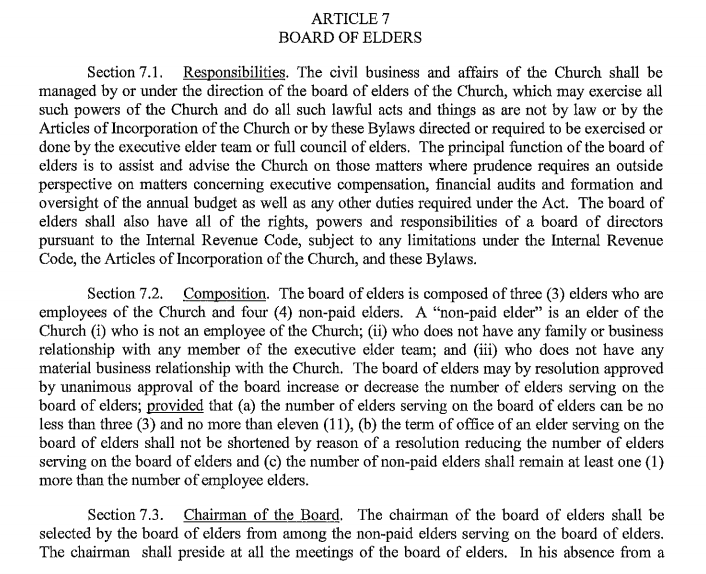 Elders may be removed by the executive elders. The full council votes on doctrinal changes and on a slate of elders by the current board of elders (see below for the composition of that board). This appears to be the Board of Advisors and Accountability which consists of the three executive elders (Driscoll, Bruskas, & Turner) and the non-paid outsiders (Tripp, Osborne, Skaik, & Phelps). This board is self-perpetuating and appears to be the final authority at MHC. The Board of Elders set the salary for the executive team, which means that the executive team plus one other member can set salaries. Mark Driscoll is president with a pretty strong position.